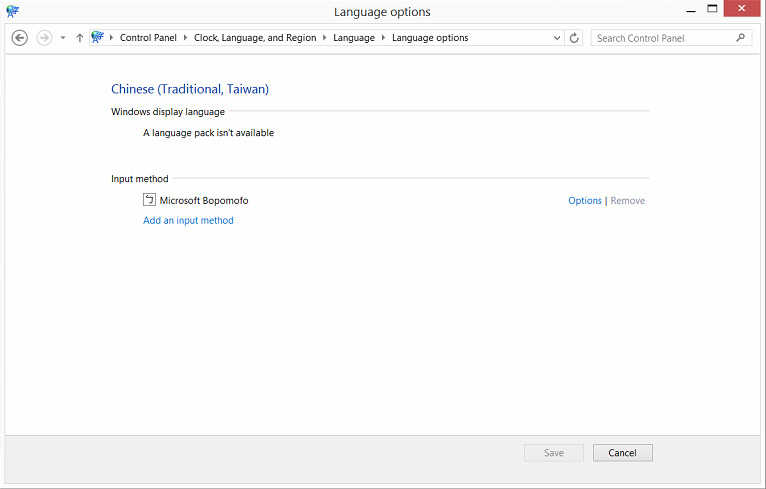 (SOLVED) Windows 8.1 Fixing "A language pack is not available" so you can set Traditional Chinese to be Windows Display Language! As you can see, I cannot install Traditional Chinese as the Windows display language because "A language pack isn't available" when I try to select Traditional Chinese as the Windows display language. The problem is I want to change my Windows display language to Traditional Chinese. What can I do? Although this tutorial is written for Traditional Chinese and for Windows 8.1, it should work with any other languages for both Windows 8 and Windows 8.1. The cause of this problem is that you cannot select Traditional Chinese (Taiwan) as the language for the Windows display language. You must select another Traditional Chinese language to be the Windows display language. The solution is remove the currently installed Traditional Chinese language, and add the Traditional Chinese language back by selecting "Chinese (Traditional, Hong Kong SAR)" this time. If you don't get it, read on for a step-by-step guide. Let's assume that you already have some Traditional Chinese language installed, but you are unable to use it as the Windows display language. Follow the following steps and you'll be able to change your Windows display language to Traditional Chinese. - Navigate to "Control Panel\Clock, Language, and Region\Language"
You should see 中文(台灣) in the list of languages inside a window titled "Change your language preferences". - Click "Add a language"
You should be back in the window titled "Change your language preferences". You should see a window in which you see "A language pack for Chinese (Traditional, Hong Kong SAR) is available for download". If you don't see it let me know. - Click "Download and install language pack"
You should see a window titled "The updates are being downloaded and installed". The size is 289.00 MB. - Once it's installed, reboot. - Navigate to the window titled "Change your language preferences" and select "Chinese (Traditional)" as the primary language. - Reboot and you should be seeing the user interface of your Windows 8.1 in Traditional Chinese.